In Italy we celebrate the 20th anniversary of the web. Internet was born in the early years of the 20th century at the end of 1980s at CERN. 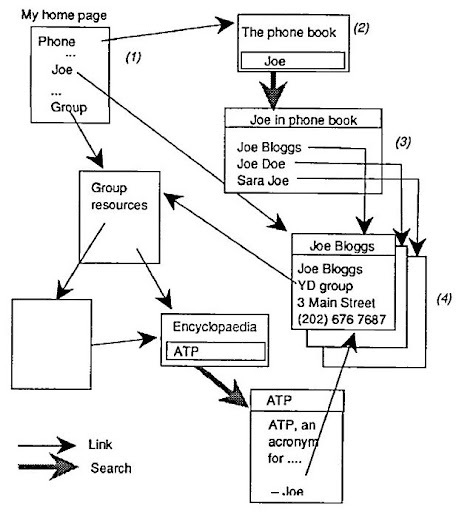 On 13rd March of 20 years ago Tim Berners-Lee (list of publications) with Robert Caillau and others propose a project to construct a scientific world network: the world-wide web. 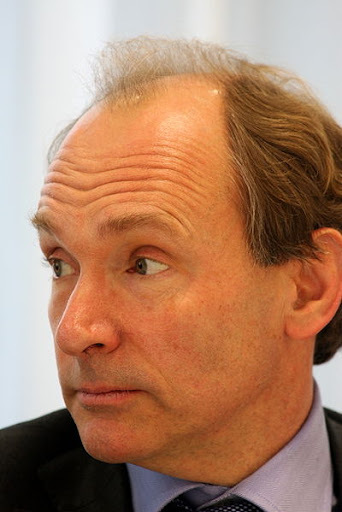 Berners-Lee is a computer scientist, in particular expert in text editors, real-time software and communications. He is considered the most influencal scientists alive today, and he started to work on hypertextual systems in 1980 developing Enquire, and in 1989 he started the World-Wide Iniziative. Robert Caillau joined it in 1990 and in the next year arrived also Jean-François Groff and Bernd Pollerman. The team laid the basis of the modern web with three papers: World-Wide Web: The information universe(6), World-Wide Web: An information infrastructure for high-energy physics(7), World-Wide Web(8). Pick up your pen, mouse, or favorite pointing device and press it on a reference in this document perhaps to the author's name, or organization, or some related work. Suppose you are then directly presented with the background material other papers, the author's coordinates, the organization's address, and its entire telephone directory. Suppose each of these documents has the same property of being linked to other original documents all over the world. You would have at your fingertips all you need to know about electronic publishing, highenergy physics, or for that matter, Asian culture. If you are reading this article on paper, you can only dream, but read on. The construction of Berners-Lee's group dream start in 1945 with the historical paper of Vannevar Bush, As we may think(1) where the american inventor laid the basis to construct a scientists' network through hypertexts. The way towards this system had another founding father, Douglas Engelbart(2). He is also an american inventor, with scandinavian origin, pioneer in the development of graphical user interfaces. And after Bush and Engelbart we arrive to Berners-Lee, Caillau and collegues. Indexes are documents, and so may themselves be found by searches and/or following links. An index is represented to the user by a "cover page" that describes the data indexed and the properties of the search engine. The documents in the web do not have to exist as files; they can be "virtual" documents generated by a server in response to a query or document name. They can therefore represent views of databases, or snapshots of changing data (such as the weather forecasts, financial information, etc.). And these are the three elements that developers try to upgrade in present day. These architectures have assumed that users share a common application program running on computers (often of the same type) that share a common file system. 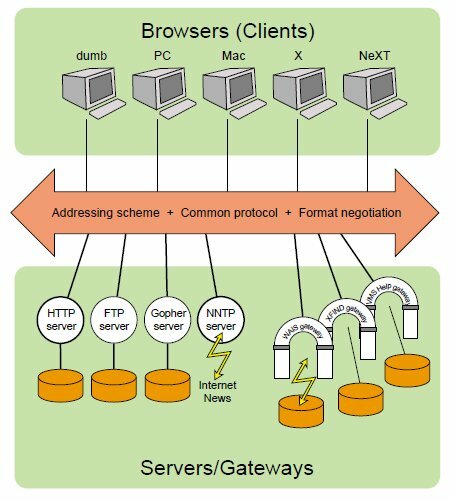 This architecture is based on two protocols: FTP (File Transfer Protocol), that allows access to web archives, and uploading and downloading documents(3, 6); NNTP (Network News Transfer Protocol), which is the protocol for access to newsgroups and reading the news(4, 6). Another important protocol is HTTP (HyperText Transfer Protocol), that needs to retrieve any information, not necessarily like hypertext, with the speed of a hyperlink(5, 7). Others nonstandard protocols are WAIS (Wide Area Information Server) and Internet Gopher, the first to perform searches on servers(7), the second provides an information service distributed constituted by interconnected menu and files(7). After the construction of the network, it's need to define documents in order to writing, indexing, searching, classifying in a very simple way. Starting from SGML it was developed HTML (HyperText Markup Language), a tagging scheme. In this way every part of the document is boxed between some tag that define the visible and invisible parts of the documents. So, with the same TeX's phylosophy(8), a web document is divided in a preambol, with all information about the html doc useful for viewing and indexing, and the visible part, with formatting tag, that defines paragraphs, tables, lists, menu, and so on. One can represent one's own view of the world, and connect it to other people's data. The system was tested at CERN using the NEXT machine with NEXT-Step OS(6), the project developed by Steve Jobs when he didn't work at Apple.